Understanding the behavior of physicians, hospitals, drug companies, health insurers, and device manufacturers, as this book seeks to do, is critical if we are to change the system. The problem that they create, however, isn’t just that health care costs consumers too much; it’s also that the quality lags behind what is achievable—is evidenced by the poor standing of the US compared to other developed countries. Failing to consider both quality and cost is regrettable—we might, after all, be willing to tolerate the enrichment of drug company shareholders if what we got in return was an excellent, if pricey, product. The litany of shenanigans by big business may be familiar to many readers, but Rosenthal's comprehensive and detailed accounting is impressive and compelling. Consider the first chapter on “the age of insurance.” The book recounts the story of how the same treatment costs orders of magnitude more--$100,000 vs $19,000 per medication infusion for a drug given monthly—when administered at NYU’s Langone Medical Center than when provided at another nearby facility. For the patient, whose treatment was covered by insurance, it didn’t much matter over the short run. But for the system as a whole, and ultimately for all patients through higher insurance premiums, it did matter. And the reason for the discrepancy is that NYU negotiated a better deal with third party payers than did the competition. What Rosenthal outlines but does not emphasize is that more powerful hospital systems and physician researchers interact with (some might say collude with) health insurance companies to produce this result. She explains that because of an arrangement with the NYU researcher who was largely responsible for creating the drug, NYU derived profit if total sales of the drug exceed a particular threshold. By negotiating a very high payment for the drug from the insurer, NYU is likely to exceed the threshold and cash in. So it’s not just the motivations of physicians, hospitals, and insurance companies acting separately that impact the health care system; it’s the way all of these forces work together that is crucial to achieving the end result. Rosenthal presents one disturbing case after another. There’s the way hospitals and physicians game the system to assure that patients essentially have to use out-of-network providers when their insurance company will only cover in-network providers, forcing patients to shoulder what can be enormous costs. There’s the notorious “facility fee” that enables hospitals to charge insurers vastly more for a simple procedure such as injecting anti-inflammatory medication into a joint if it is done in an outpatient clinic than if it is done in a private office. What she neglects to explain is the way the system conspires to provide what is often inferior medical care to patients. Maybe this is more egregious with older patients than younger ones, and her focus is overwhelmingly people who aren’t enrolled in Medicare: either those with private insurance or no insurance at all. The facility fee example, for instance, doesn’t just mean higher costs. For a frail older person to get to a hospital clinic may mean going by car, negotiating a confusing parking garage, and walking a considerable distance from the garage to the office, none of which is so easy if you’re 85, have severe arthritis (the reason for going for the joint injection in the first place), and maybe have a little cognitive impairment to boot. The enthusiasm for high tech procedures, driven in part by the manufacturers of the devices used in the procedures, doesn’t merely drive up costs: for vulnerable, older individuals, such technological intervention may cause more harm than good. The anesthesia may result in confusion and the hospital stay in functional decline—quite apart from the effect on the cost of medical care. Alas, the fixes the author proposes, the part of the book devoted to taking "health care back" from big business, aren’t going to fix the system. She calls for creative insurance plan design, for example plans that cover “essential” treatment fully and levy co-pays for “semi-elective” treatment. That’s much like what the ACA does when it requires full coverage for preventive services such as a screening colonoscopy, but allows the same colonoscopy to be billed in full (if the patient has a high deductible health plan) if the procedure is ordered to remove a cancerous polyp. Maybe that’s a good idea, although it leads to some bizarre incentives—better to get that polyp removed at the end of the plan year, when you might already have burned through your deductible, than at the beginning of the year, when the growth might be more curable; better to say nothing to your doctor about the blood you’ve noticed in your stools and just have a “screening test” than to mention the blood and undergo the procedure to treat a “disease.” But whether or not “benefit redesign” is a good idea—and one of the last major benefit redesign ideas wasn't so thrilling, it was those very high deductible health plans that are conquering the market—it’s not going to help patients now. Even the suggestions that could, in principle, help right away, such as “demanding price transparency” when getting an MRI, are a bit pie-in-the sky. You’re in the doctor’s office and s/he wants you to get a scan right away. You’re supposed to get a list of 5 centers that do MRIs and compare their prices? Really? What about quality? What about accessibility of the image to your physician? What about transportation to these other sites? 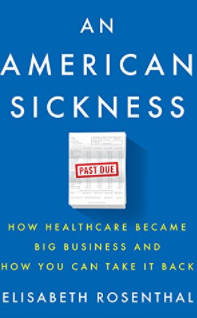 An American Sickness goes a long way to uncovering the workings of the health system and for that it is to be lauded. It is extensively and for the most part carefully researched, though there are errors. Rosenthal says pharmacists should be able to prescribe birth control pills because they all have PhDs and shouldn’t just be relegated to counting pills. Maybe they should be able to prescribe birth control pills, but most pharmacists have a BPharm (a bachelor’s degree), not a PhD. She says the website GoodRx allows comparison of prices for prescription drugs only for Medicare patients. Maybe that was once true, but it is no longer. But read this book for the insight it may give you on how the design of the system affects outcomes. We will need to build on that scaffolding to investigate the full range of systemic consequences—for quality as well as cost of health care, and to engage in meaningful reform. In the sixties, physicians routinely prescribed bed rest for patients who had suffered a heart attack. Then along came the recognition that bed rest led to clot formation in the lower extremities, clots that sometimes broke off and traveled to the lungs, causing potentially life-threatening pulmonary emboli. Bed rest also led to deconditioning—when patients finally were allowed to get up, they found they were often weak and wobbly. And so bed rest was out and early mobilization was in. But now, concurrent with a vigorous attempt to prevent falls among older hospitalized patients, bed rest is back in—and with more complications than ever, as reported in a thoughtful article in JAMA Internal Medicine last week. Paradoxically, the means used by hospitals to prevent falls don’t work. Bed (and chair) alarms are ineffective—which is not entirely surprising, as by the time a nurse responds to the buzzer indicating the patient has gotten out of bed (or chair), the person is probably already on the floor. Even a multi-prong study from Australia using a variety of different approaches simultaneously was unsuccessful. But all those bed alarms and signs on the door do achieve something, and that’s to keep patients at bed rest. And just as bed rest was bad for heart attack patients in the sixties, it’s bad for older patients today. Bed rest promotes the development of confusion (delirium) and worsens mobility, so when patients finally do get out of bed, either late in their hospital stay or after they get home, they are more likely to fall. Growdon, a resident in internal medicine at a major Boston teaching hospital, and his colleagues at a VA Hospital in Florida and at Hebrew Senior Life, a teaching nursing home, are rightfully indignant. They advocate promoting mobility rather than penalizing falls, arguing that “although hospital falls can lead to harm, treating them as ‘never events’ has led to over implementation of measures with little efficacy for falls [prevention] yet profound contribution to immobility.” They are, no doubt, correct. But why? Why should an incentive program based on outcomes lead to the adoption of a strategy that does not lead to the desired outcome? If CMS had used a process measure, if it had offered extra payments to hospitals that introduced fall prevention programs, I wouldn't have been surprised that it resulted in hospitals adopting programs for the sake of having something, regardless of efficacy. But instead it opted to penalize hospitals for performing poorly, which should by rights have led to hospitals choosing to take steps that made a difference. What is it about the culture of hospitals or the leadership of hospital CEOs or the knowledge base of physicians and nurses that lets them make such irrational choices? I wish I knew the answer. In the meantime, perhaps CMS would do well to offer carrots rather than sticks, and to be specific about the kind of carrots that it likes the most. If programs that promote mobility work, directives to get patients out of bed early and to consult physical therapy—both to prevent falls and to maintain function—then it’s those specific programs it should endorse and pay for.